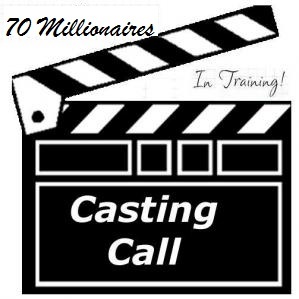 Casting Call: 70 Future Millionaires Wanted! So far, this blog has covered – in a random way – perhaps 10% – 20% of what I have to offer, and over the next 2 years you can expect that to double again … so, if you can wait 4 or 5 years (and, can unscramble the order that I deliver this content in) you will know at least half of what I have to offer. If you have been around – reading this blog – for the past two years, you will already know about my Other Site, which was host to a unique online experiment where a real multi-millionare (that would be me) offered to mentor just 7 people to make their own fortune. Scott, Ryan, Josh, Debbie (who volunteered to leave the program to help me write a book about their experiences with this experiment), Jeff (who replaced Debbie), Diane, Mark and Lee (a retired Police Chaplan!) all participated and you can read about their experiences on that site. If you are a regular reader of this blog, and meet a couple of very small criteria, ALL of this content is – and, will always remain – free to you! You see, I am opening up this site to just 70 more Millionaires … in Training! and, will be offering memberships to qualified applicants for a small monthly fee … but, not for you – as a reader of this blog, I feel morally obligated (seriously!) to keep my promise that I would NEVER ask you to pay a dime for my online services. This won’t stop me from advertising the hell out of this re-launched site elsewhere, looking for paying customers … but, NOT HERE. Foundation Membership (this is exclusive for the first 70 QUALIFYING $7million7years readers) is just like the Premium Mmbership that others will need to pay for – but, you get it for LIFE and for FREE. Most importantly, you will find THE ONE THING – more than any other – that helped me move from $30k in debt to $7 million in the bank in just 7 years … and, how it is virtually guaranteed to work for you. … no, this is a NEW and UNIQUE Guided Learning Experience that will show you how to get as rich as you need to be, doing whatever it is that you are most passionate about. If you want to become one of the 70 Millionaires … In Training! click here now, before 70 others jump in ahead of you! There’s nothing more to know! This entry was posted in Rich and tagged millionaire, millionaire in training, money, net worth, Rich, wealth by Adrian. Bookmark the permalink. This is brilliant! I’m mulling over right now if I want to do it! I’m not quite clear on what exactly it is you will be offering? Encouragement? @ Sam – Thanks! Not sure about Richard Dennis, though – for a start, I’m not charging and this isn’t a training program … mentoring, maybe … power-of-crowds maybe … we’ll see how it develops. @ blogrdoc – Once you decide, apply and see if you make the ‘cut’. GL! … YOU decide the destination (the when/how much), and the type of roads that you want to travel (stocks, business, job, blogging – the ways are many and varied), and I will act as your GPS-Navigator. The 7m7y.com site will be recording the various ‘trips’ so that others can follow along (a kind of Personal Finance ‘Lonely Planet’). When I first read about your new site, the first thing that popped into my mind was the “turtle traders” – a group of people from a variety of backgrounds who applied to learn commodities trading from Richard Dennis, a trader who made hundreds of millions of dollars and agreed to coach the people who were chosen from the pool of applicants. Maybe it will be like those events, and maybe it will be completely different. Either way, I’m excited to follow along! AJC, is admission on a rolling basis or is it sometime after June 2? is this like an American thing you have to do to not be sued. legal lad over at quick and dirty (home of grammar girl) has the same thing on his pod cast, and MMND did the same thing before giving out advice. Seems like alot of overkill to me. @ Rob – LOL. Unfortunately, it’s the way things HAVE to be done over here 🙂 I am NOT a licenced professional, so I can’t give financial advice … let somebody else take your money! Just sent in my application. It was a great chance for me to confirm on paper what I am looking for with your opportunity. @ David – Good Luck! Hi there, I’d definetely be interested in being one of your 7 million in 7 years participants.